Wonder (2017) is a difficult film to review. To begin with, the sheer emotional war it wages on you leaves your heart broken and tissue packet empty. Focused on the life of Auggie (Jacob Tremblay), Wonder homes in on an event which most children struggle with: moving schools. Only, Auggie has a disadvantage: being home-schooled means this will be his first experience of mainstream education. Not only that, but to others, he looks different: Auggie is a boy with facial differences. He has a rare facial deformity which calls “mandibulofacial dysostosis”. One surprise (non-spoiler) is that the film shows not only his life but the lives of those closest to him and how Auggie impacts the world and people around him. And boy, the acting of the supporting cast is incredible. Throughout, Julia Roberts and Owen Wilson portray Auggie’s caring parents Isabel and Nate, each a different side of the coin. You have Isabel pushing Auggie out into the world whereas Nate wishes to protect and shield him from life. Both act beautifully, if a little type-caste – that’s no bad thing with either pair though. Auggie’s sister, Via (played by the enigmatic Izabela Vidovic) also has problems. Over the course of the film, we learn about Via’s struggles with life. There is not a single character who you dislike. Apologies, one: the typical bully, Julian (Bryce Gheisar) who you just have to hate. Some of his put-downs are imaginative and quite creative too, making way for some of the considerably tear-inducing scenes. Auggie’s teacher, played by Daveed Diggs, is another prime example of a character you simply just feel so connected to. 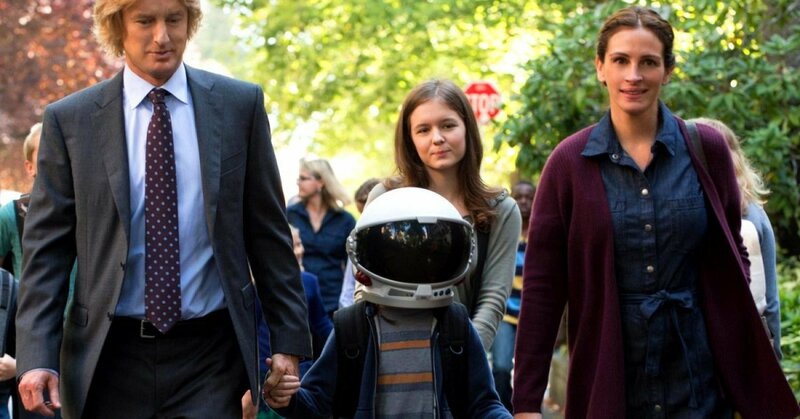 While Auggie’s life makes up the bulk of the story-telling (including learning about that space helmet), we learn so much about all of the other characters that even their stories enter into our hearts. The audience genuinely feels for the characters from side-lined Via, to just-wanting-to-fit-in best friend Jack Will (Noah Jupe). With the inclusion of Star Wars references always being a sure win- the appearance of Chewie, the Emperor and even the Padawan’s symbolic braid add moments of humour to the film. Furthering on from this, humour is used so well that it never feels false or just simply included- there is always a purpose behind it. Take for example, Auggie joking about his appearance which is used to show his growing resilience and trust in someone else. Wonder really is the epitomy of its film title. A heart-warming, tear-jerking ride through about a year of Auggie’s life, Wonder is an incredibly moving film without a single flaw. To simply put, “Inspirational” does not do justice to this film- every single person needs to watch this epic- a modern classic because they might just learn to change the way they see (courtesy of Mr Tushman, not my own words sadly). This is simply a “must-see” film. Some features on a DVD might seem only just worthwhile watching. Not so here- the features provide lengthy details into the film, from behind the scenes interviews, meeting the author (R.J. Palacio) and commentaries about the film. Entertaining and informative, they provide great insight into the film and are well worth investing the time to watch after the film. Essential watching as extras go. Check out the pictures again- you might find R.J.Palacio’s cameo- comment below where you think she is. Wonder releases on DVD/Blu-Ray on 26th March.